It had been a long time since I’d listened to The Bananas – and I have to ask myself why. It’s that peppy, poppy, yet underproduced DIY thing that I basically groove on. A few seconds of “La Touraine” is all it takes to get the leg bouncing and a smile on my face. I’m not going to say that the band plays happy-punk, but the beat is in that Ramones vein that gives energy to the listener but with a more varied rhythm section. Its follow-up on this 9-minute tape is “Brother, Can You Spare A Dime?” which is a little less of a straight-forward structure, mixing some tempo changes with a drawn-out breakdown, a bit of shouting, then a hyper final stanza to close it out. It’s what The Bananas do: it’s both pop-punk as you expect it, but with unexpected turns along the way and a grainy production that keeps it from getting too highfalutin. Rivers Edge take the B-side here. Sharing members with Future Virgins (and more), it’s fast, up-tempo stuff too, but a with a subtle depth of different styles in the songwriting. 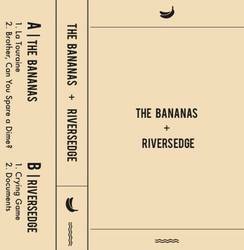 While the drumming on The Bananas’ side is bouncing and constantly pushing forward, Rivers Edge weaves up and down as it moves through its plot. Similar to Future Virgins, the vocals in “Crying Game” emote in a way that kicks it up a notch at chorus time. Then, in “Documents,” it reminds me a bit more of Basement Benders, in her angry vocal delivery. The music, meanwhile, is a bit more layered than Basement Benders while it’s more primal than Future Virgins, adding a bit of feedback for depth. Rivers Edge certainly reflect the voices of its members, but it’s a bit tougher at the same time. The sound is rough and a little confrontational, music to vent rather than connect. The two bands complement each other well, as they both are clearly within the punk genre but offer nuance and complex emotions that go well beyond the tired 1-2-3-4 trope. Posted April 1, 2019, 5:30 p.m.